Marvel’s “Black Panther” is setting a new box office record for opening weekend. Marvel’s “Black Panther” hit theaters last weekend. It made an estimated $192 million between Friday and Sunday in North America. A news release by Disney said, it is estimated to make $362 million internationally. It is the fifth-largest movie opening behind The Avengers, Star Wars: The Force Awakens and Star Wars: The Last Jedi. It out-earned Deadpool making it the biggest February debut of all time. It is also the second largest Marvel debut. The record-breaking numbers are also starting to raise hopes of opening the doors for more films with a primarily African American cast. In Hollywood there are few films with a primarily black cast, they are often underinvested, but Black Panther is changing that. “The concept of an African story, with actors of African descent at the forefront, combined with the scale of modern franchise filmmaking, is something that hasn’t really been done before,” said Ryan Coogler, the director of Black Panther, in an interview with The Hollywood Reporter. Ryan Coogler received a $200 million budget to direct the movie, a rare and almost unheard-of amount for an African American director. They also rolled out a nine-month marketing campaign. Black Panther is the only Marvel movie directed by a black director. It is the highest grossing film in history by a black director. 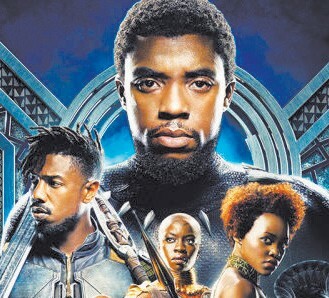 “Hopefully someday we’ll look back at the release of Black Panther as the turning point when diversity and positive representation in blockbusters switched from being an anomaly to being normal,” said Phil Contrino, Director of media and research for the National Association of Theater Owners.